4/16/2019 - Hawaiian Gold Jewelry Discount 40% Sale Off Entire Website! 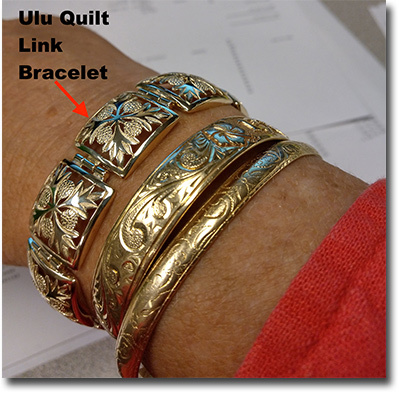 12/13/2018 - I have been eyeing the Ulu Quilt Link Bracelet PL 2 18mm (to Sz 7) bracelet for a couple of years... this year I took the plunge and couldn't be more pleased. Ernest was there every step of the way to help me make the purchase. It arrived sooner than I had expected; I so prefer when I am underpromised and overdelivered !!! Thanks HGJ for the excellent service from start to finish !!! 5/21/2018 - 14K Hawaiian Gold Jewelry Watch - Discount Sale Launched! OVER 30% OFF! 5/1/2018 - Have a Golden Mother's Day! 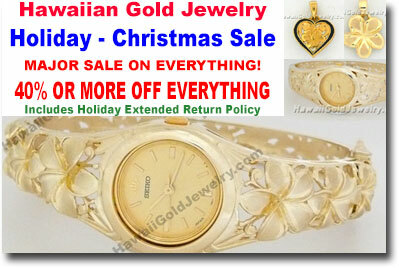 - Hawaii Gold Jewelry - Mother's Day Sale BIG DISCOUNT OFF ENTIRE WEBSITE! What better way to honor that special woman in your life but with the gift of Gold. Our lovely selection of "Mom" pendants, rings and earrings will surely bring a smile to her face. Featuring a Hibiscus Flower design with Hawaiian Scroll, this classic bangle never goes out of style! It comes in a variety of widths and sizes and as always, is 14K Yellow gold. Our Tiare Collection comes in a variety of Earrings, Pendants that is a perfect gift for any occasion. Whether you're saying "Aloha", "Mahalo" or "just because", our Tiare jewelry collection is sure to be a hit. The Hawaiian hibiscus is perhaps one of the best representation of the Hawaiian islands. The yellow hibiscus is Hawaii's state flower, also known as the pua aloalo. Hawaiians originally adopted the hibiscus flower as their official territorial flower in the early 1920's. In 1988, the Hawaii state legislature officially adopted the yellow hibiscus as the state flower. Each Hawaiian island also has its own designated Hibiscus flower. View our popular Hawaiian Hibiscus design jewelry and pick your favorite. Our Hawaiian Gold Jewelry Round Pendants are perfect for any occasion! Inspired from lovely Hawaiian flowers such as the Plumeria and Hibiscus, our 14K Yellow Gold jewelry comes in a variety designs. This Hawaiian gold link bracelet watch is both elegant and functional and comes in a variety of classic Hawaiian designs such as Multi Quilt, Bird of Paradise Link, Plumeria and more. As the holiday season approaches, get your shopping list started! Browse through our Hawaiian Gold Watch Collection and check out the latest designs and styles. The Ribbon Plumeria Pendant and Earring is a stunning 14K gold pendant and earring of a ribbon design that forms the shape of a traditional Hawaiian Plumeria flower. The Hawaiian Fish Hook pendant is delicately crafted and features the elegant design of a traditional Hawaiian fish hook. Say 'Yes" to Our Hawaiian Gold French Mount Rings. Looking for wedding or engagement ring ideas? Our French Mount rings are truly inspiring! We have added super size images of our products online so you can really see the quality and details. Look for "Click here to view super large image and more details..." below any description and the link will take you of a very large version of the image. Our 14K Yellow Gold Hawaiian Gold Bangles are the perfect accessory for any occasion. The Hibiscus Flower with Hawaiian scroll design is a popular choice and comes in a range of widths and sizes. This season of love, show your heart with our Hawaiian Cut-Out Heart Ring. This Hibiscus Flower with Hawaiian Scroll ring comes in 14K Yellow Gold with a choice of plain or black border. If you're looking for a Valentine's gift for him, look no further. Our Men's Square/Round Rings will surely take his breath away! Profess your love this Valentine's Day in gold! Give your special love our 14K Yellow Gold Sweetheart ID Bracelet to show how special they are to you. If you're looking for a unique ring for a unique person (or for yourself), our Napua Cut-Out Rings stands out from the rest. Start the New Year in style with a new Hawaiian Gold Round Bracelet! Our 14K Yellow Gold Round Hibiscus Flower Bracelet is a great choice and pairs well with any attire or occasion. 12/26/2016 - New Year, New Rings! Check out our latest collection of Hawaiian Gold Rings. From traditional Hawaiian inspired scrolls and raised enamel designs to contemporary designs with diamonds, we've got what you need to start the new year right! Whether it's for the holidays or any special occasion, our Hoku (star)- shaped pendant is a great gift idea! Anyone who receives our Napua Cut-Out Rings this Holiday season will surely feel special and one-of-a-kind! Enjoy shopping online this holiday season knowing that all transactions are safe and secure! HawaiiGoldJewelry.com's entire online e-commerce system is driven by Safe and Secure PayPal and populated by the MBC DirectoryMaker. Earrings are always a classic gift to give (and receive) during the holidays. 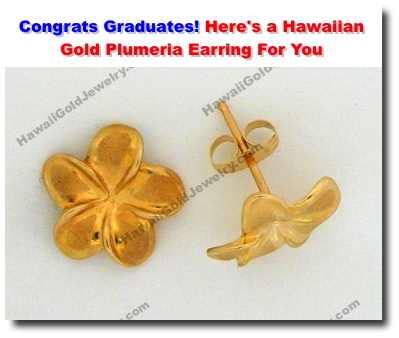 Make it a Hawaiian Gold Jewelry earring and they'll love it even more! Our latest featured Hawaiian Gold Jewelry is sure to make you shine in any occasion. These 14K Yellow Gold Teardrop-shaped earrings feature a lovely Hibiscus flower design and comes in black or plain border. It's a great gift for that special someone that's sure to bring a sparkle in their eye! Don't wait for the mad rush of Black Friday! At Hawaiian Gold Jewelry, you can find great deals from some of our best selling jewelry! 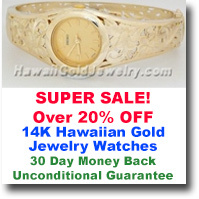 Video of our Hawaiian gold jewelry watch collection and current sale/discount. Our elegant Ladies Bangle Watch lets you to hit two birds with one golden stone! Featuring a lovely Hibiscus flower design with a classic Hawaiian scroll, this is both a great timepiece and a wonderful accessory. This week's featured Hawaiian Gold Jewelry is our Round Plumeria Earring. Featuring a Plumeria flower design with a classic Hawaiian scroll, these 14K Yellow Gold earrings come in two sizes (12mm or 16mm) and a plain or black border. Try something different with our Pineapple Quilt Earrings. Showcasing a classic Pineapple Quilt pattern, these 14K Yellow Gold earrings come in plain or black border. It comes in two sizes and a great accessory for any occasion! Our lovely Keiki Ipu Earrings is a great gift idea. It is 8mm x 31mm in size and can be engraved with the child's initials, making it a special and customized gift that she will remember. The lovely Hibiscus Flower is captured so elegantly in our Hawaiian Gold Vertical Floater Pendants. Available in plain or black border, these 14K Yellow Gold tube vertical pendants come in an assortment of sizes and designs. Express your friendship in gold! Our Friendship Heart Ring is a great gift idea for your best friend. With your choice of raised letter or raised enamel letter for their initial, this 14K Yellow Gold ring is sure to be a great way to heart! Add a touch of sophistication in your ensemble with our Black Pearl Pendant. This particular design comes with a ribbon slide and is 13 mm (width) x 19 mm (height) in size. Our Plumeria Necklace features a lovely 14K Yellow Gold chain with a plumeria flower design. You can choose between two widths, 14mm or 19mm and is a great accessory to have for any occasion! This 14K Yellow Gold bangle features a lovely Plumeria flower design with Hawaiian scroll. It comes with a circumference of 7" or 7.5" and two unique designs. 8/15/2016 - Plumeria #234 Pendant w/Diamonds. 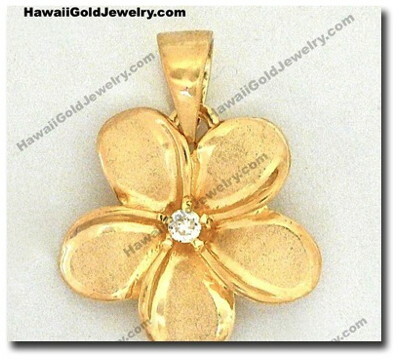 This week's featured Hawaiian Gold Jewelry is our Plumeria #234 Pendant w/Diamonds. This classic design captures the beauty of the plumeria flower we know and love. The diamond accents on each gold flower adds a sparkle to any ensemble. The lovely plumeria flower has once again inspired our jewelry designs. This time with our Plumeria Link Bracelet. Be the star of any occasion with our Hoku Earrings! Our Hoku (star) shaped earrings are engraved with a Floral Hawaiian Scroll and come in either plain or black border. Hawaiian Gold Jewelry is proud to carry a varied selection of men's jewelry. Whether you're looking for a fashionable ring or pendant, you've come to the right place! The Kukui nut (candlenut tree) is a popular product of nature that has inspired many Hawaiian quilt patterns and jewelry designs. Our Kukui Quilt Ring comes in plain or black border and a variety of sizes. Drawing inspiration from the lovely hibiscus flower combined with the great tradition of Hawaiian quilting, this 14K Yellow Gold is a wonderful representation art in jewelry. Our Hawaiian Gold Anthurium Quilt Pendants draws inspiration from traditional Hawaiian quilts. Available in plain or black border, our 14K Yellow Gold pendants come in various sizes and dimensions. Your maid-of-honor and bridesmaids play a significant role to support you on your wedding day. If you've been looking for a special gift to show your thanks, our Double Heart ID Bracelet is a great choice! Our Hawaiian Gold Slider Bracelets are versatile and a great accessory for any occasion. It comes in 14K Yellow Gold 1.2 mm rope and goes up to a size 7. Here's another great wedding ring choice for the bride-to-be! Choose from our wide selection of 14K Yellow Gold Dome Rings. Whether you're looking for a great wedding ring or a gift for that special man in your life, our 14K Hawaiian Gold Ring is a great choice for him! It's Dad's turn to be treated with the gift of gold! What better way to treat that special father in your life with our 14K Yellow Gold Palaoa Pendant! This graduation season, we bring you another classic gift that's a great way to treat that special graduate in your life. Reward them with our 14K Plumeria Flower Earring. Show your wacky side with our Hawaiian Gold Smiley Floater Pendants! The Plumeria flower has never looked so beautiful in gold! Add a touch of diamond on the center and you've got yourself a wonderful gift for just about any occasion. Graduation season kicks off soon and here's a great gift idea for that special graduate in your life! Don't wait until the last minute to shop for Mom! Express your love for that special woman in your life with our Hawaiian Gold Mom Jewelry Collection. Heart pendants never go out of style. Add a Hibiscus Flower With Hawaiian Scroll to it and you've got yourself a unique gift for just about any special occasion! The Honu (Hawaiian Green Sea Turtle) has a special place in our hearts. Not only are these precious creatures of the sea, they also represent good luck and long life. Hawaii's cool, laid back lifestyle is represented by our love for slippers. Bring a piece of Hawaii with you wherever you go with our 14K Yellow Gold Slipper Link Bracelets! Telling time has never been this elegant! Our 14K Yellow Gold Link Bracelet Watches are great gift ideas and have elegant design options ranging from Bird of Paradise, Puanani and Multi-Quilt scrolls. Our Hawaiian Gold Cross Pendants offer an extra glimmer to any birthday or religious event. Whether it be a birthday, first communion or wedding gift, you can't go wrong with these 14K Yellow Gold Hawaiian Scroll cross pendants. Add a hint of sophistication to your ensemble with our Golden Pearl Pendants! These 14K Yellow Gold pendants have a Plumeria Flower With Hawaiian Scroll design and features several variations . Dangle Earrings never go out of style and pair well with almost any attire or occasion. This 14K Yellow Gold Heart Earring is just the right size. Demonstration of putting on the Ladies Bangle Watch Round Size. If walking along the beach is your kind of romantic date, then this Slipper Pendant with Raised Hearts might just be the gift you're looking for. A great friend deserves only the gift of gold. With our 14K Friendship Heart Pendants, your friend or loved one will know that your gift truly comes from the heart! These versatile Hibiscus Flower Scallop Earrings are elegant and work well with almost any attire or occasion. A unique Hawaiian Scroll enhances this piece and comes in two sizes (small or large). Nothing says elegance more than our 14K Plumeria Flower Slide Pendants! Our selection comes in a variety of sizes and features (with Diamond or Tanzanite) and are all great accessories for any occasion. Nothing emphasizes your feelings better than a double heart! Our Hawaiian Gold Double Heart Jewelry Collection are elegant and suitable for any occasion. Our Double Heart ID Bracelets are both versatile and elegant and can fit any occasion. Whether you are buying it as a gift or rewarding yourself with the gift of gold, this bracelet is the perfect choice! 11/30/2015 - Your Satisfaction Is Our Guarantee! Our mission at HawaiianGoldJewelry.com is to provide quality Hawaiian jewelry with excellent customer service and integrity. 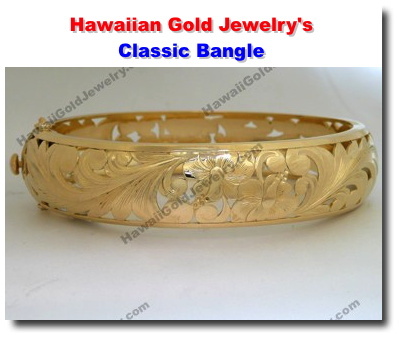 Our website has over 900+ high quality Hawaiian 14K Solid Gold Jewelry items (Made in Hawaii). For the young ones this holiday season, nothing is more memorable than the gift of gold! From Rings to Pendants to their first pair of earrings, give them a gift that will last a lifetime! Teardrop pendants are always a classic and are perfect for any occasion! Our Hawaiian Gold Teardrop Pendant Collection are inspired by two popular Hawaiian flowers, the Hibiscus and Plumeria. Available in plain or black border. Proudly show your faith with our elegant selection of Hawaiian Gold Cross Pendants. Great as a first communion gifts or for any occasion! Available in plain or black border or with Hawaiian Scroll. Check out our online shopping cart! Anthuriums, in Greek, means "tail flower." The red, heart-shaped flower of the Anthurium is called a spathe while the tall "spike" is the spadix where it's tiny flowers grow. Most common colors of anthuriums are red (or shades of red). Anthuriums are one of the most popular flowers in Hawaii and is one of the more long-lasting ones. The Hawaiian Ipu is percussion instrument made from gourds and is often used during hula dances to provide a beat for the dancers. Our Hawaiian Ipu Jewelry honors this wonderful instrument. Our 14K Gold Hawaiian Ipu pendants come in small or medium sizes. Hawaiian warrior helmets were originally worn as protective headgear by members of a warrior society called makini who were responsible for the protection of their alii (high chief). 9/1/2015 - These Pendants Are The Keys To Their Hearts! Introducing our new Key Plumeria Pendants! These dazzling 14K gold key pendants have our signature Hawaiian Gold designs that the beauty of the Hawaiian Plumeria flower. There's something special for everyone at Hawaii Gold Jewelry, even for that special man in your life! From men's rings to a Palaoa Pendant, show him you care with the gift of gold! If you're looking for a unique Hawaiian Gold Earring that is both fashionable and elegant, then our Leialoha Heart Earring might be for you! The unique 14K Yellow Gold Hawaiian floral design features the Hawaii Hibiscus flower and leaves and is a great accessory for any type of occasion. It is also a great gift that truly says aloha! Our Hawaiian Gold Flower Anklets are simple yet beautiful and elegant. The lovely Hawaiian plumeria flower is the heart of this piece and is a great accessory that fits any casual or formal attire and any occasion! Check out our shopping cart and bring home one today! 6/8/2015 - Stand Out With Our Hibiscus Dome Pendants! If you're looking for a unique pendant that stands out from the rest of the crowd, be sure to check out our beautiful Hibiscus Dome Pendants. This 14K Yellow Gold pendant has an elegant Hawaiian inspired scroll with the Hibiscus flower in the center. Available in plain or black border. A great addition to your pendant collection or as a gift! Bird Of Paradise (strelitzia reginae), also called the "crane flower", gets it's name from it's resemblance to the head a tropical bird. The unique beauty of the Hawaiian Bird of Paradise flower is captured in our Hawaiian Gold Jewelry Bird of Paradise collection. 5/28/2015 - Say "Mahalo" To a Special Friend With Our Friendship Heart Stud Earrings! Nothing says "thank you for being a great friend" like the gift of gold. More specifically, the gift of Hawaiian Gold Jewelry's Friendship Heart Stud Earrings. Our selection of 14K Yellow Gold earrings come in either a plain or black border. Options for raised letter or raised enamel letter also available. 5/11/2015 - Diamonds Are Our Best Friend! 5/4/2015 - Say "I Do" with our Hawaiian Gold Jewelry Rings! Planning to tie the knot soon? Be sure to explore our fine selection of Hawaiian gold rings that will bring the perfect sparkle to your wedding day! Lovely Hawaiian inspired designs available. The Golden Pearl is produced by the golden-lipped oyster that are mostly located in the South East Asia region where the water is warm giving these pearls a natural looking golden color. Perfect as a pendant jewelry! Anklets are one of the more traditional pieces of jewelry that have withstood the test of time. Wearing this piece of jewelry symbolizes different things for various cultures. Ancient Egyptian culture believed that wearing an anklet could bring them luck and good fortune. In the United States, it is worn in both casual and formal settings. Nothing expresses our local lifestyle more than our love for the comfortable slipper. Now wear it as a link bracelet and show some island flare with our Hawaiian Gold Slipper Link Bracelets! If you're looking for a classic look, elegant Hawaiian Gold Dome Hoop Earrings might just be right for you. We have a variety of floral designs as well as gold with or without black border. Here is another wonderful Hawaiian Quilt design inspired by Hawaiian imagery. Take home our unique Pineapple Quilt Earrings that come in a variety of dimensions and sizes. 3/23/2015 - Hawaiian Gold Floater Pendants: Contemporary and Classic at the same time! Whether you're looking for a great gift idea or an accessory that will enhance your style, these Hawaiian gold floater pendants are just what you need! Choose classic lettering, flowers or hearts and even a smiley face, you'll be sure to find a design and size that will fit your personality. Give the gift of time and gold all in one piece! Our Hawaiian 14K yellow gold link bracelet is both elegant and functional and comes in a variety of classic Hawaiian designs such as Bird of Paradise, Puanani and Multi-Quilt. View video or Hawaiian gold jewelry with diamonds. Groups of Hawaiian heirloom gold jewelry with diamonds by category. View Hawaiian gold jewelry collections. Groups of Hawaiian heirloom gold jewelry by category. Collection of Hawaiian gold jewelry with Hawaiian slipper, slippers, flip flops, etc.. Pendants, rings, bracelets and more. Collection of Hawaiian gold jewelry with black and gold pearls. Collection of Hawaiian gold jewelry with diamonds. Pendants, rings, bracelets and more. NEW CATALOG PHOTO GALLERY - Hawaii Gold Jewelry .Com is full service online jewelry website offering Hawaiian Heirloom jewelry. Our mission is to provide quality Hawaiian jewelry products and services and practice integrity in all that we do. Over 900+ high quality Hawaiian 14K Solid Gold Jewelry items (made in Hawaii) are featured on our website. A necklace has always been a timeless piece and one of our popular Hawaiian gold jewelry items. The lovely plumeria flower design is perfect either as a gift for any special occasion, especially this coming Mother's Day or to use for your own enjoyment. Our Plumeria necklace now comes in white gold and rose gold so be sure to view our shopping cart today! Hawaiian Quilt designs were evolved from the Hawaiian people's relationships with nature, culture and even sometimes inspired by their dreams. The Kukui nut (candlenut tree) is a popular product of nature that has inspired many Quilt and jewelry designs. Black pearls or Tahitian pearls are highly valued because of their rarity. Stand out from the crowd with our one of a kind Black Pearl Pendants! Our Hawaiian gold link bracelet watch is both elegant and functional and comes in a variety of classic Hawaiian designs such as Multi Quilt, Bird of Paradise Link, Plumeria and more. The Palaoa pendant was considered a sign of respect in Hawaiian culture and was once only worn by Hawaiian royalty. The whale was first identified as the "Palaoa" (toothed whale). Our Hawaiian Stickpins are both functional and decorative. The timeless designs are inspired from classic Hawaiian flowers such as the Puanani and Bird of Paradise. These lovely stickpins are great as gifts or to own for yourself! Start the New Year with a bit of gold! Our Hawaiian Gold rings are always a hot item any time of the year. Our rings come in many forms from traditional designs to a variety of Hawaiian inspired flower designs. We also have a good mix of rings for men! Our Plumeria Gold Pendants are the perfect accessory for any jewelry lover! It's the perfect item that will add some sparkle and shine during the Holidays or any day! Designs come in Plumeria flower with Hawaiian scroll and more. Ulu (or breadfruit) is a distinctive food-bearing tree which produces abundantly from late summer into winter. Traditionally, Ulu is planted to provide a lifetime of food during the birth of a child. Breadfruit leaf designs are often used in Hawaiian quilt patterns and are also printed on fabrics and other materials such as ceramics. Our selection of Ulu Quilt jewelry highlights the beauty of the plant as well as the quilt patterns it has inspired. We have a variety of Ulu Quilt rings, bracelets, earrings and Pendants for your choose from. CALL 808-739-9797 FOR SPECIAL DEAL ON ULU QUILT PACKAGE PURCHASE (all items up to 50% off!). With the deep connection that Hawaiians have with the ocean, the Fish Hook or makau in Hawaiian, is a wonderful symbol of all that is good and promises its wearer good luck, strength and prosperity. Click on link to Take a look at our lovely Fish Hook Pendant. Give your keiki some bling and let their natural charm shine! Browse through our lovely line of Hawaiian gold jewelry for your baby. We have cute slipper pendants, earrings and lovely rings. Hoku is the Hawaiian word for star and is also a familiar Hawaiian name. Do you know someone named Hoku or if would like to give this as a gift to the "star" in your life? View our available Hoku pendants adorned with floral prints. 6/1/2013 - Start your Power Search for Gold! Looking for something specific on our website? We've made it easier with our Power Search function! Just look for the 3rd yellow box at the top of our website and start searching for that perfect gold jewelry! The Hawaiian Green Sea Turtle, called Honu, has a special meaning to the people of Hawaii. It symbolizes long life, and is revered as a sacred symbol of "mana" (life force). Because it is on the verge of extinction, the honu is protected under the U.S. Endangered Species Act. We have upgraded our search function to better serve our visitors. Search box on top of every page. Features image display and date/relevance sorting. The gift of gold is a great way to show someone how much you care! Choose from our lovely selection of Hawaiian gold Heart Plumeria Pendants. Any one of these would be perfect for your special Valentine! 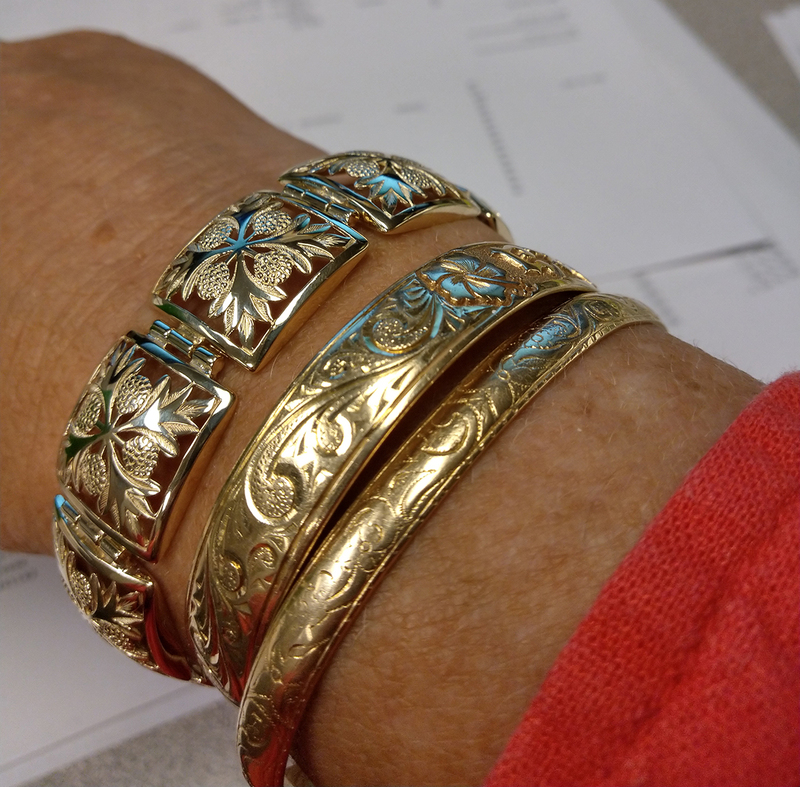 12/1/2012 - Just in time for the Holidays, new Hawaiian Gold Bracelet designs! Be sure to browse through our selection of Hawaiian Gold bracelets. We offer a variety of Hawaiian floral designs as well as traditional styles that is sure to be on top of anybody's shopping list! Our lovely selection of Hawaiian Gold Watches combine the sophistication of classic gold jewelry with the functionality of a trusted timepiece. Our designs are inspired from traditional Hawaiian imagery that our customers adore. Browse through our selection and choose your own Hawaiian Gold watch today! 9/6/2012 - The Hawaiian word "Kuuipo"
The Hawaiian word "kuuipo" which means sweetheart is one of the most popular words to be engraved in traditional Hawaiian gold jewelry, particularly in bracelets. Browse through our selection of Sweetheart ID bracelets to find the one that suits you or your kuuipo. The Bird of Paradise flower stands out among many Hawaiian flowers. Its unique shape and bright colors resemble a bird's beak, hence the memorable name. This flower is often found in many Hawaiian tropical gardens and is also a favorite among Hawaiian jewelry makers. Our varied selection of Bird of Paradise Rings is a prime example. Visit our Hawaiian Rings page for more details (available in White and Rose Gold). It's not only the ladies that look good in gold. Here are some of our popular gold jewelry for men! If you're looking around for wedding rings, don't forget to check out our online selection of Hawaiian Wedding Rings featuring the classic Hawaiian Plumeria and Hibiscus designs. Our lovely Hawaiian Gold Stickpin collection has been updated. Take your pick from our selection of elegantly crafted designs inspired by Hawaii's Plumeria flower and Birds of Paradise flower. Love your feet! Accessorize and show it off with any of our Hawaiian Gold Anklet and Toe Ring selections. 4/17/2012 - HGJ Super Sale Going on right now! 30% off entire website PLUS 30-Day Unconditional Guarantee Shop now! You don't need a special occasion to reward yourself with any of our beautiful 14K Hawaiian Gold Rings. 3/15/2012 - There's a Hawaiian Gold Pendant for Everyone. Find the right style of Hawaiian gold pendant that's right for you. Browse through our selection and take your pick of contemporary, classic or Hawaiian inspired designs. We stand behind our prices. If you find the exact same product that is sold or advertised at a lower price, we will match it! Our classic Hawaiian Gold bangles reflect the style and design made popular by Hawaii's Queen Liliuokalani. The roots of Hawaiian gold jewelry can be traced back to the era of the Hawaiian Monarchy and it's friendship with the British crown, particularly the Queen who adored the designs that were popular in Britain. Our Flower Necklaces and Plumeria designs are a perfect gift for any occasion. Be if for yourself or someone special, take a closer look at your next great gift idea! 2/2/2012 - Win $100 credit on HawaiiGoldJewelry.Com! View the Timeless Beauty of Hawaiian Gold Watches! Nothing is more unique and timeless than our 14K Hawaiian Gold Watches. Featuring classic designs of popular Hawaiian flowers like Bird of Paradise, Plumeria and Hibiscus. You can now own your own piece of Hawaiian Gold with our signature 14K Hawaiian Gold Rings. We have rings for just about any special occasion and it comes in a variety of styles, cuts and engravings. Did you know that first names are the most often used word enameled on Hawaiian heirloom bracelets? Mothers usually wear bracelets bearing their children's names and when the child grows up and gets married the bracelet is frequently bestowed upon the namesake. The Key Plumeria Pendant is a dazzling 14K gold key pendant. This lustrous gold pendant is delicately crafted and features the elegant design of a key. Available in oval, round, heart designs. The Plumeria Ribbon Pendant is a stunning 14K gold pendant is of a ribbon design that forms the shape of a traditional Hawaiian Plumeria flower. It comes in Small, Medium and Large sizes and has a matte outlay finish intertwined with a glossy inside. This Ribbon Plumeria Pendant also comes in two varieties, one with a Diamond in the center and one without. It will add a simple yet elegant "bling" to any clothing ensemble! Be one of the first have this beautiful new item. The Ribbon Plumeria Earring is stunning 14K gold pendant is of a ribbon design that forms the shape of a traditional Hawaiian Plumeria flower. It comes in Small, Medium and Large sizes and has a matte outlay finish intertwined with a glossy inside. This Ribbon Plumeria Earring also comes in two varieties, one with a Diamond in the center and one without. It will add a simple yet elegant "bling" to any clothing ensemble! Be one of the first have this beautiful new item. The Fish Hook is a dazzling 14K gold Fish Hook pendant. This lustrous gold pendant is delicately crafted and features the elegant design of a traditional Hawaiian fish hook. It comes in one size at this time medium. Definitely a great catch! Ideal gift for men. 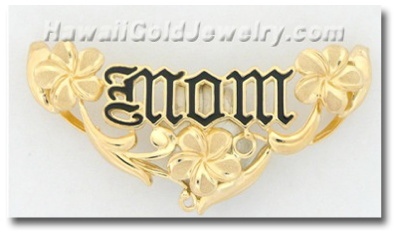 View our selection of Hawaiian Jewelry with the word "Mom" inscribe on it. We have some great Hawaiian baby jewelry. We have a beautiful matching toe ring and anklet. Our Hawaiian wedding and bridal jewelry is very popular. View our wedding rings. Men like jewelry too. View our Hawaiian men's jewelry collection.